Earlier this month, Capital Hospice invited the News-Press to its annual Point of Hope Camp, which took place Friday, Aug. 1 through Sunday, Aug. 3. This year Point of Hope set up at Camp Ramblewood, located in the green backwoods about an hour northeast of Baltimore, Md. Capital Hospice has served the region for 30 years with facilities in D.C., Maryland and Virginia, providing terminally ill individuals with services and medical attention aimed at “palliative treatment,” or the general improvement of the patient’s quality of life and to ease their suffering. “Palliative care” distinguishes hospices from other medical options in that attempts at curing the patient are not pursued. 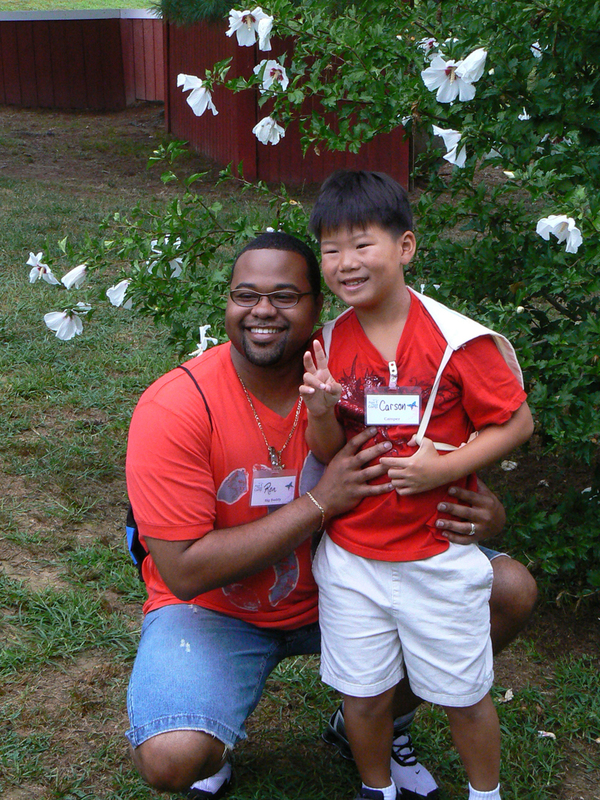 Much like the quality of life care Capital Hospice provides its patients, its annual Point of Hope Camp offers individuals and families a weekend to regain peace of mind and to piece together their lives after the death of loved ones. The camp engages its 219 attendees in activities one would find at typical summer camps – arts and crafts, relaxation sessions, theater performances and the like – remains unique, providing not only fun and excitement, but the tools to cope with loss. Philip Carpenter, the camp’s director since 2000, noted that most losses are recent, occurring between three and 24 months ago. The camp doesn’t replace grief, but it does do its best to give attendees an “emotionally safe” place to express their feelings, said Spencer Levine, who acts in part as the camp’s spokesperson, and Director of Communications for Capital Hospice in Falls Church. Levine was kind enough to take another role to his busy schedule, acting as the News-Press tour guide and liaison for the greater part of Saturday. Arriving on Saturday morning, this writer joined the attendees a day into their activities. They had either driven here yesterday by themselves or taken Capital Hospice’s offer of three chartered buses to navigate to Camp Ramblewood, tucked well into the idyllic calm of rural Maryland. Levine escorted me from the parking lot to the central hub of Point of Hope, a large compound of different segments and responsibilities – mess hall, craft rooms, a lecture/activity room and a wraparound veranda that overlooked the (often crowded) swimming pool. True to its name, Ramblewood seems to ramble down the hill where the main compound sits, down to the pavilion and pond, across the way to the cabins that line the forest perimeter. Farther up a hill, a barn overlooks the rest of the camp. Each part of the campground houses an activity, the cabins as lodges. Campers apply in advance to come to Point of Hope, Levine explained, not all of them having lost their relatives in hospice care. Additionally, schools have referred children and their families to the camp. When they come to Point of Hope, the attendees are organized by age group – adults, teenagers and children – who are then directed by the camp’s staff. The staff behind the Point of Hope operation consists of volunteers; their duties are wide-ranging, from manning the mess hall to bonding with the children as “big buddies,” with some running the larger scene. Carpenter is aided by walkie talkies and his ever-attentive assistant camp director Julie Weatherington who in her normal capacity serves as Capital Hospice’s outreach coordinator in Prince William County. Levine noted that many of the staff volunteers involve their families, too. Weatherington’s son Derek and daughter Hanna are both volunteers this year. “Many [volunteers] are health care providers who help and support what we do,” Levine added, like Scott Berger, a bereavement counselor with Point of Hope for five years now. This year, his wife Christine joined him. “It’s the first time I feel I can give back” as a member of the support staff, she said. Down at the open-air pavilion, which children had decorated with commemorative flags for the deceased, a group of children and their big buddies joined some members of D.C. theater troupe Arena Stage on a large floor space fit for country square dancing. It worked out just fine for Arena Stage’s purposes, too, leading the large ensemble in several theater games and warm-up sessions to engage the “rainbow of emotions” grieving campers might experience. “You can also show emotions with your body,” said one of the actors. The session concluded with a series of tableaux – frozen scene performances – by campers. Heading toward the barn where teens met with grief counselor Kathy Elias and several art therapists for a face mask project, we came across Jesselyn Ombac, Sara Woody and Weatherington’s daughter, Hanna. 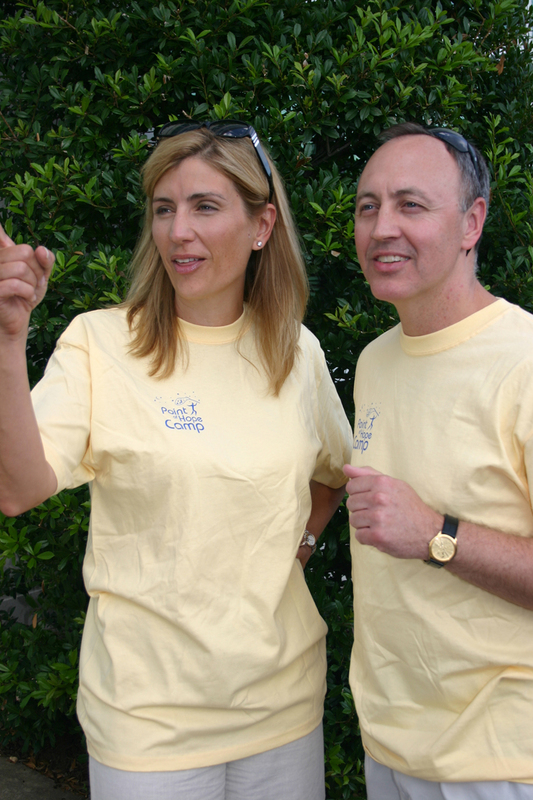 They comprise Point of Hope’s recreations team that orchestrates the camp’s “fun and exciting” events. At the moment, the three young volunteers were armed with hose and balloons, busily preparing for the post-lunch water balloon toss. “When I was in high school and college, I didn’t have the time to volunteer,” said Ombac, echoing her colleagues’ reasons for coming out to Point of Hope. Inside the barn, Elias and her coterie of art therapists assisted the teens at various stages of having their faces encased in paper-maché and laying their visual impressions to dry. Identity served as the project’s theme, she said, raising plenty of questions for the teen-aged artists who would later decorate their face masks. 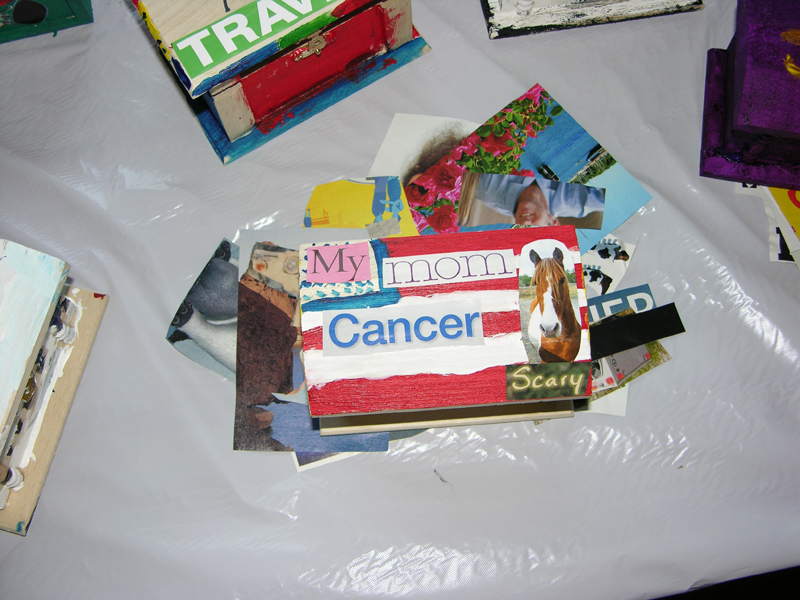 Sharing loss is very personal at Point of Hope, yet the intimacy of campers’ stories does not deter them from being told. At one point in the mess hall, a couple traded tragic tales of their lost son with a young foreigner. Strangers bonding out of empathy is a familiar sight across Ramblewood. During a lull in activities, Weatherington interviewed campers – from among the attendees, big buddies and staff – for an end-of-camp video compilation. It was a firsthand chance to hear the intimate stories of the adults and children, outside of their therapy sessions and the camp atmosphere. They are individuals and families seeking some understanding about their losses. “They feel alone,” Carpenter said about the initial feelings at camp. A day into activities, however, some campers felt uplifted by the camp. The Chen family suffered the loss of a husband and father. Lana Chen brought her children Alexandra “Zan,” 10, and Carson, 8, to the camp following the death of her husband. “My husband had care at the hospice,” Chen said, “but surprisingly I didn’t hear about it directly from the staff there.” Instead, she discovered Point of Hope through her local pastor and a referral from the children’s school counselor. The common emotions that pull individuals to Point of Hope attracted Jennifer Betts of Baltimore, who lost her mother in 2002 under hospice care. The hospice inspired her to volunteer as a part of the support staff last year, she said. Now, Betts is a member of the nurse team that issues prescribed medications to campers; and she also aids the kitchen staff. As a “big buddy” for the past 12 summers, Bern Beidel of Centerville, Va. employs plenty of strength and energy, flitting across camp between activities and the pool as, this year, he escorts the young Charles Lamb, who recently lost his father. Beidel’s wife Donna has also been active with Point of Hope as a former camp office manager. Also attending the camp are several fervent donors, among them Sue Handley, who is a big buddy to a 7-year-old this year. Last year, Dunleavy recalled, the golf tournament entertained about 80 donors with lunch, a round of golf and a dinner that included a “really fantastic” PowerPoint presentation of the previous camp put together by Weatherington. Carol Kennedy, who organizes many of the fundraisers, added that last year’s net gross was around $35,000. This year’s tournament occurs on Sept. 22. The golf tournament is one fundraiser in a packed schedule, as Kennedy laid out the year’s charity events, ranging from balls to sailing regattas. Coupled with sponsorships from major donors like Booze Allen Hamilton, Capital Hospice’s reach is far-ranging, thanks to its donors’ continuing support in promoting awareness of the hospice’s programs. Weatherington also expresses interest in a “reunion camp” where former campers could share their progress and reunite with the friends they made during their camp experience. “Society doesn’t give us a lot of time to grieve,” she pointed out, allowing people merely weeks or a few months to cope with loss. The power of one weekend, however, seemed capable of bringing some hope to dealing with the impact of death. After camp, “we hear from [guidance counselors] of a dramatic difference” in children, she said. It is the least a weekend-long camp could hope to accomplish in anyone’s life.